Today’s politicians are confronted with new information technologies to tackle complex decision-making problems. In order to make sustainable decisions, a profound analysis of societal problems and possible solutions (policy options) needs to be performed. In this policy-analysis process, different stakeholders are involved. Besides internal direct advisors of the policy makers (policy analysts), external experts from different scientific disciplines can support evidence-based decision making. Despite the alleged importance of scientific advice in the policy-making process, it is observed that scientific results are often not used. In this work, a concept is described that supports the collaboration between scientists and politicians. 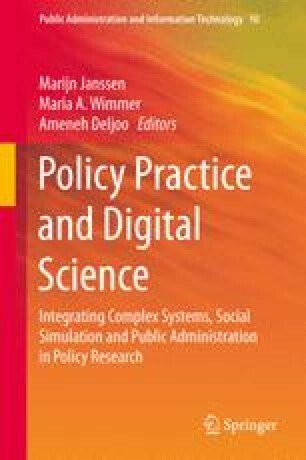 We propose a science–policy interface that is realized by including information visualization in the policy-analysis process. Therefore, we identify synergy effects between both fields and introduce a methodology for addressing the current challenges of science–policy interfaces with visualization. Finally, we describe three exemplary case studies carried out in European research projects that instantiate the concept of this approach. Research presented here is partly carried out within the project “urbanAPI” (Interactive Analysis, Simulation and Visualisation Tools for Urban Agile Policy Implementation), and “ePolicy”(Engineering the Policy-Making Life Cycle) funded from the 7th Framework Program of the European Commission, call identifier: FP7-ICT-2011-7, under the grant agreement no: 288577 (urbanAPI), and no: 288147 (ePolicy), started in October 2011.